Why I choose a fit first philosophy. My bike fitting specializes in true dynamic fit by using the Dynamic Fit Unit as our main tool of choice. With the dynamic fit bike, we use 2-D video capture, pedal stroke analysis, muscle balance assessment, and power analysis technology. This combination of bike fit service provides an enhanced and comprehensive fit. With degrees in Kinesiology, Exercise Physiology and Biomechanics, I have worked with amateur and professional athletes by enhancing athletic performance. Within my 24 years of education and experience in physiology and biomechanics, I have spent 10 of those years with focus on proper bike fitting. I have been educated by some of the best in the industry, including GURU Fit School and Dan Empfield, as a F.I.S.T. Advanced Professional Bike Fitter. I regularly continue my education to learn the latest in bike fit advancements. My goal is to provide you the ultimate experience in bike fitting, while working with you in a one-on-one environment to optimize your cycling experience. I cater to road cyclists and triathletes, at any fitness or experience level. I utilize the Dynamic Fit Unit system to best find your proper measurements. By using a Dynamic Fit bike, it allows me to make precise movements to find the most comfortable and powerful position for you. You are fit while you are riding, which allows precise measurements and changes to fine-tune even the best of fits. This highly beneficial fit series will be set into a few phases (depending on your fit path). Your fit session will include a head-to-toe anatomical evaluation. This will establish baseline information for your entire fit session. The fit includes a review of your riding style, goals, and physical measurements to make the appropriate adjustments on your bike, or the creation of a new bike. When we find your ideal position, I continue with education on pedaling technique, corrective actions to enhance cycling performance, and a plan of action to increase your cycling abilities. 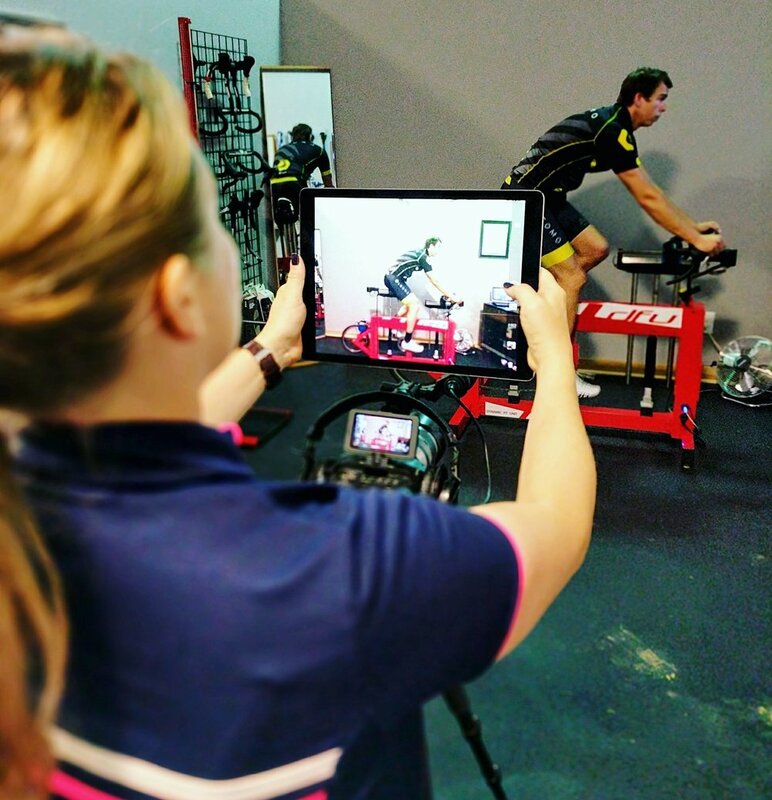 To enhance your bike fit experience and analysis, add-on a motion analysis to your session and learn more about your pedal stroke, decelerations in your power application, preventing or improving injury and enhance your competitive edge. I look forward to meeting you and working with you on your bike! If you are searching for a new bike, fit is the crucial first step in what we call a complete bike solution. Instead of figuring out how you fit aboard any bike, I can help determine to the millimeter a complete bike that will work best under your specific fit coordinates. This includes bike frame size, proper seat post, stem, handlebars, crank arm, and more. I proudly work with Alchemy, Argon 18, BMC, Factor and Wilier. These bike companies believe in my mission of providing fit first for all new bike purchase experiences. New bike? Re-fit your current bike? Rocket Bikes can provide the tools to help you get to your next goal. Fit for a current bike includes two follow-up sessions. Purchase a new bike after your bike fit within 30 days and receive half your fit payment towards your purchase. You will also receive fits for the life of you and your bike at no charge. You may make your appointment today HERE.